The activity includes one triple sheave, one double sheave, and two single sheave pulleys, as well as a beautifully illustrated activity guide with questions, making it ideal for single student study or as a demonstration unit. Pulleys were among the first machines invented by man. They used them in ingenious ways to help solve problems and perform tasks more easily. 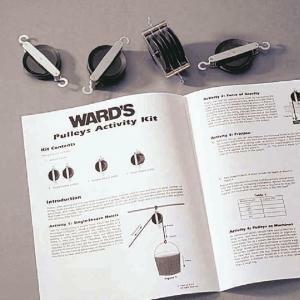 In this economical activity, students construct both single and compound pulley systems and observe their function. Students explore the concepts of gravity, force, friction, mechanical advantage, and more.